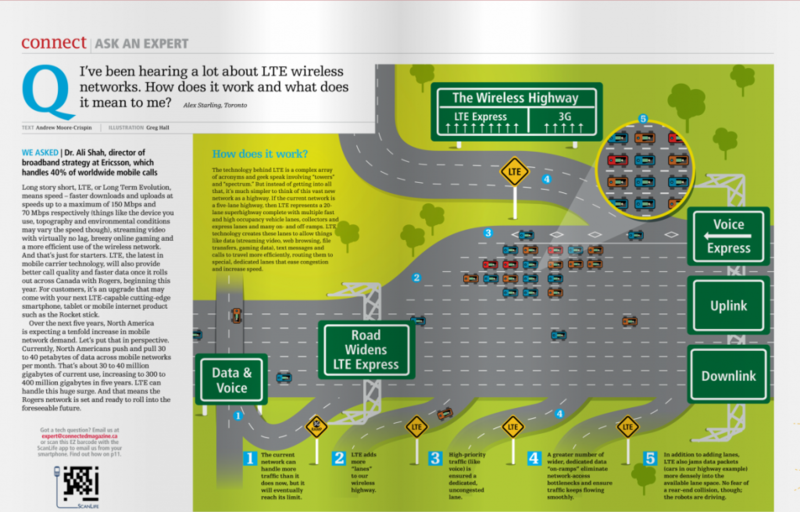 While usually we find a lot of dumbed down explanations terrible, we actually found that this recent article posted in the Connected Magazine by Rogers is actually a good way of trying to describe LTE (long term evolution) to the general public without needing to know a lot of the information that goes back behind wireless networks. That’s the basics of it essentially. Here’s where the article shines, it’s highway annalogy. Imagine the current network is a 5 lane highway, LTE will increase that highway to 20 lanes! All in all this promises a greater wireless experience for the end user! In addition to all this, we’ve talked to network developers about the matter and one huge benefit of LTE is the recievers are much SMALLER and more POWERFUL so instead of having hundreds of giant ugly mobile towers around our country, LTE towers can fit ONTOP of light posts making them barely visible! With Bell and Rogers now fighting over who will launch LTE first, we’ll soon be able to see how this amazing new network will work! Rogers is currently poised to launch LTE in Ottawa this summer so stay tuned for more information soon!